Snack Girl may not be the brightest bulb in the bunch but she thinks she knows a scam when she sees it. I would NEVER presume to say that I am smarter than a Supreme Court such as Justice Kennedy, but I am (perhaps) more practiced at buying juice than he is. Yeahhhh. I bet he doesn’t read closely enough, that slacker, Kennedy. Except that my guess would be he has to READ all day and pay attention to the details to be a Supreme Court justice. 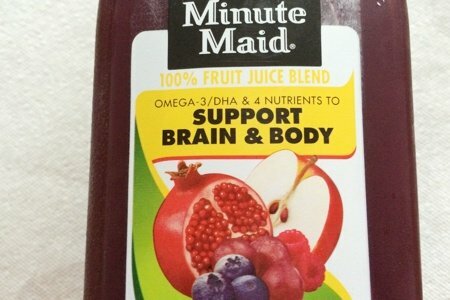 The FDA, which monitors labels on behalf of consumers, cannot touch Minute Maid because they can only go after “false claims”. For example, if the juice had no pomegranate in it, the FDA can fine them and force them to change the label. But, now, because of this decision, companies can sue each other over misleading labels. I have been angered over many ridiculous label claims. Now, all I have to do is find companies willing to take on their competitors in the courts to get the labels to change. All that sugar will be very good for my body and brain because I write and you know writers need sugar or else we start writing terrible sentences like this one. This juice, sadly enough, has two more grams per sugar in it than the same serving of Coke. I did try it and it doesn’t taste anything like pomegranate. It tastes like fruit punch. What do you think of Minute Maid Pomegranate Blueberry? Raspberry Lemonade With 50% Less Sugar From Tropicana: Healthy? I'd also add that if there's 0 fat, the amount of omegas is pretty pathetic. Just sayin. 100% fruit juice BLEND. Blend should be the clue! I didn't think it was possible to cram more sugar into a glass of liquid than the amount in a Coke! Good for the court allowing for a lawsuit! Good post, Barbara. I also grew up in the fifties and I think you are correct about grazing. Also, the hidden sugars in our foods are making us adults fat, now. I really wish people would be reasonable about "all that sugar in those juices". Number one, this is not a product I would buy, however I will buy things like 100% orange juice by Simply Orange. If you look at the nutrition facts label, it has 23g of sugars. This is naturally occurring sugar that is in oranges people! I am glad that the new nutrition labels may be able to clarify this for people by separating out added sugars from the naturally occurring sugars in fruit and milk!! The natural fructose and lactose that occur in 100% juice and plain white milk have no business being compared to Coke! 100% fruit juice is fine in small quantities...a serving size of 1/2 to 1 cup for the day....not the 12-16oz of orange juice people guzzle down for breakfast! I prefer to chew my fruit, but a 4oz serving of OJ with my oats and skim milk for breakfast hits the spot and is perfectly healthy. If you want to compare sugars, then compare kool aid to coke, not 100% fruit juice. If only you were correct. That orange juice has been sitting around so long that they have to add 'flavor packs' to it to make it palatable. I really, really, really miss juice - especially orange juice. But none of the stuff sold in the store as juice is good for you. so glad that you OUT these lies(misleading)from MAJOR food manufacturers! please keep us informed about the direction POM goes after coke. I used to think that fruit juice consecrate was pure juice until you educated me. Thanks Snack Girl for letting us know the real story! Anyone who truly wants to know about the deadly affects of sugar should check out "sugar, the bitter truth" on You Tube. Sugar is the new crack cocaine of this generation! Scary and very sad. Love your sarcasm. I mean really I must try this since my body and brain need a lot of support. People PLEASE all this talk about sugar really?? I mean I don't care what you are eating there is probably sugar in it somewhere.Lets not forget the food producers ok.They are in the business of making money ,more and more money.They don't care one dam bit about my health or yours.It is all about the dollar.That's it the money is all that counts.They have all been hiding horrible things that they put in the food, ingredients they know are bad for us but they don't care,and never will.Yes, growing up with the food we had was great,but we are in a whole different place now.Nothing is true, nothing is honest, everything is full of deceit and lies.Please wake up this is the world we have all created. I have not bought Minute Maid in about 40 Years. It is expensive and I don't get the fiber from processed fruit drinks. Why would anybody waste their money on this? There is no added sugar, this is sugar from the fruit and it does say fruit blend but I still would not buy it. I buy Welch's Grape juice for our blood sugar lows otherwise I make a smoothie with ice and whole fruits. Grape juice doesn't work as fast as apple juice because it is lower in sugar but we like it better. I read all the labels of processed food or just don't buy it. Make a smoothie from some berries or mangoes, much better. I think if I wanted to drink fruit punch I'd look for fruit punch. I typically don't buy Minute Maid because most of their juices are blends. I guess I'm a bit of a juice snob, my kids and I like 100% juice with little or no added sugar. We mix it with seltzer sometimes. Juice always seems like a better beverage choice than soda, but a good reminder that we all really need to read the labels more closely. I'm sure Snack Girl, that you know this, but everyone else needs to understand that sugar is sugar and the body only knows it as that, PERIOD. It is very important to watch how many grams of sugar you consume in a day and one of the biggest culprits of sugar consumption are beverages, whether juice or soda. It is best to not consume either at all. Everyone should drink water and have the later as an occasional treat. Nutritionally, there is nothing beneficial in juice that you can't get from the whole fruit instead! this should be every serious food shopper's mantra! alexander. a revelation as to where all the 'sneaky sugars' are hiding in our food. eat an orange vs. drinking OJ. you get the benefits of fiber along with the ginormous amount of natural sugar! bon appetit. Eat the fruit instead. There is no reason to drink juice. I am upset that my tax money is going to companies fighting each other over this and people in the government making descions and they are not well educated on the topic. UGH!